The President of the Republic, Mr Danny Faure, joined the Seychelles Nekton expedition at Desroches this afternoon, where he received an update on the findings of the expedition (known as ‘First Descent’) so far. On board the research vessel ‘Ocean Zephyr’, President Faure was received by the Chief Executive of Nekton and Mission Director, Mr Oliver Steeds, and the Chair of Nekton, Mr Rupert Grey. The President was shown a short film which detailed the findings of ‘First Descent’ since it was officially launched on 2 March 2019. Supported by an Alliance of 40 partners, ‘First Descent’ refers to a series of expeditions to explore and conserve the Indian Ocean, the world’s most unknown and least protected ocean. The Seychelles Nekton mission so far has included 75 submersible dives, 300 science deployments, and the use of 21 different research technologies. On board the ‘Ocean Zephyr’, the President visited the research station and was given a presentation by the Principal Scientist of Nekton, Dr Lucy Woodall. President Faure had the opportunity to view three-dimensional maps of the seabed from the seven research sites covered in the expedition. He was also able to view video transects of the findings at various depths. ‘First Descent’ has collected over 25km of visual transects so far. 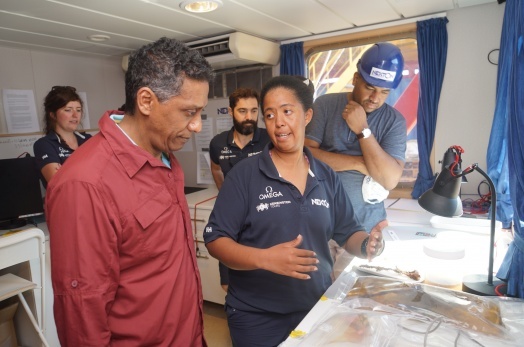 President Faure was then taken to the Wet Lab where he met two young Seychellois scientists working with First Descent, Ms Sheena Talma and Ms Stephanie Marie, who shared the various biological samples retrieved from the submersible dives. President Faure congratulated the two young women on their achievements, and encouraged them to continue working hard and inspiring young people to pursue a career in marine science. Speaking to the press after his visit, President Faure said that this historic mission shows the world the value of ocean conservation, and that it was crucial to Seychelles’ conservation efforts of 30% of its waters. He commended the ‘First Descent’ team, and said that the global attention brings attention to the number one threat affecting the world: climate change. As part of his visit to the Seychelles Nekton expedition, the President will be making an address on board ‘Ocean Zephyr’ tomorrow.